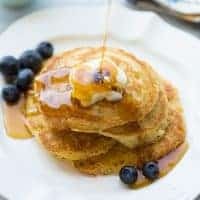 Gluten-Free Cornmeal Sour Cream Pancakes! Delicious flavor and texture! Stir the cornmeal, flour, baking powder, sugar, and salt together in a mixing bowl. Whisk together the egg, milk (start with 1/2 cup and add up to 1/4 cup to thin if needed), sour cream, and butter. Add the wet ingredients to the dry and mix to combine. Heat a non-stick skillet or griddle over medium-high heat. Once hot, add butter to coat the pan. Cook the pan cakes with 1/4 cup of batter at a time for 2-4 minutes on each side, until golden. Serve with honey butter or maple syrup. Enjoy!